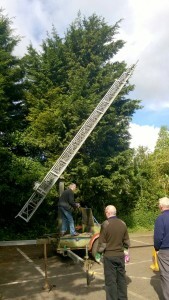 At Wythall Radio Club, we are fortunate to have in our possession a rather excellent 100ft tall Mobile Versatower. Thanks to a good turnout of club members this morning, we were able to give it a good check over and clean-up before its use on the forthcoming VHF field day on July 4th & 5th. After a few years of non-use, we were delighted to find no major problems like stuck brakes or flat tyres and the winches both worked OK. Grease, oil, and WD40 were liberally applied to various parts before the whole thing was trundled across Wythall Park for a blast with a power washer. It’s now no longer quite as green as it was(!) and we should be able to put out a nice big signal with our aerials high up this field day. We would like to say thanks to all club members who turned up to help and to Phil 2E0WTH who bullied us into doing it! Wythall Radio Club is proud to announce that both of our new D-STAR repeaters are now on the air. 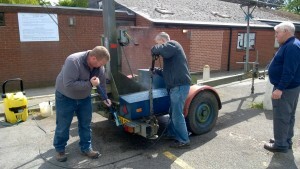 GB7SO (Solihull) went live Thursday evening, 28th May, after tests during the day from it’s location in Major’s Green. It has now been joined by GB7DG in Bromsgrove which went live today, Saturday 30th May, from the village of Dodford. Reception reports are welcome of course and so far, coverage seems pretty much in line with the predictions on the coverage maps. There is more information about GB7SO and GB7DG on their respective pages on this website, so why not pop along and find out more about the latest addition to our repeater family? It’s the season for “big name” guests at Wythall Radio Club at the moment. 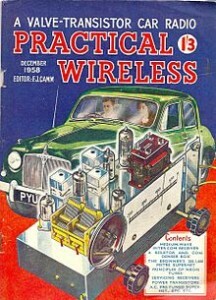 Following last week’s thoroughly professional presentation from Don G3BJ, this Tuesday we welcome another Don, G3XTT, the editor of Practical Wireless magazine. 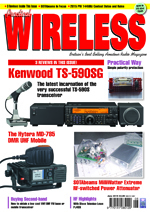 PW, as it is affectionately known, is the largest Amateur Radio magazine in the UK and has been around for many years – her editors have become household names in the hobby – many hams remember the F. J. Camm years, for example. PW has been undergoing a renaissance under new editor Don, following the recent retirement of Rob Mannion G3XFD, who was also a popular figurehead for the publication for many years. 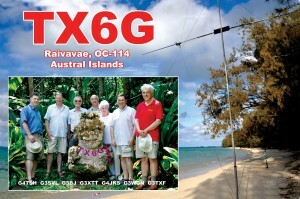 The members of Wythall Radio Club are really looking forward to welcoming Don G3XTT, who is not only a magazine editor, but is also a book author, as well as a world-renowned DXer and Contester! A Visit from the President! Wythall Radio Club members are awaiting a Presidential visit this week. Not Mr Obama or M. Hollande, we should stress, but the President of Region 1 of the International Amateur Radio Union (IARU). Don Beattie G3BJ is that man – but he is also one of the UK’s top DXpeditioners and Contesters in addition to playing a major role in our national society, the Radio Society of Great Britain (RSGB). We are honoured to have such an esteemed guest visiting us this week. There is no doubt that Don’s talk will be rather special and a highlight of this year’s Wythall RC programme. Since we are likely to be very full on Tuesday, it is worth coming early for a good seat. The venue is Wythall House, Silver Street, Wythall, B47 6LZ and the presentation starts at 20:30. We hope to see you there.